I found the complete speech Sarah Palin made at the Tea Party Convention. I always wonder why a mother of 4 who has become the Governor of Alaska in her spare time is hated for the words she speaks. Phrases like “personal responsibility” and “drill our own oil” and “stop shipping all our jobs overseas” and “let the people keep more of what they earn” have made her such a despised individual among the leftists. 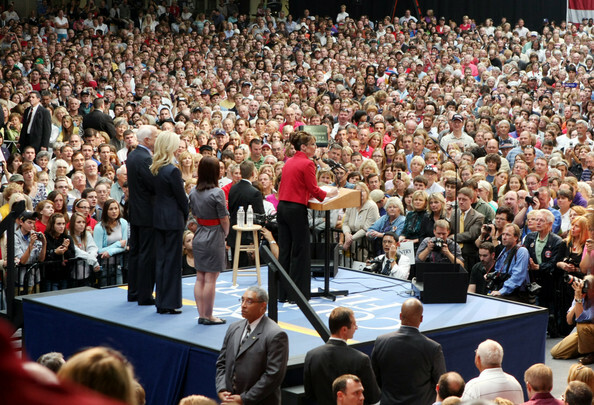 Anyway, click here for the Sarah Palin Tea Party Speech. A Newburgh institution suddenly got a little more maverick. 2008 Republican vice presidential candidate Sarah Palin will appear on Thursday’s episode of “American Chopper.” The show follows the men of Orange County Choppers, the motorcycle company based out of Newburgh. In the episode, OCC founder Paul Teutul Sr. is commissioned to Alaska to build a chopper to commemorate the state’s 50-year anniversary. The episode will air at 9 p.m. Thursday on TLC. Polls continue to indicate that Senator McCain needs a stunning reversal in the last week of the campaign to win. While one AP poll last week had him in a dead heat with Senator Obama, most polls show the 47-year-old Illinois senator with a six- to 10-point lead. And he is ahead in enough battleground states that media networks across the US are projecting a comfortable win for Senator Obama in the electoral college tally should the polling hold true. It makes reports of the internal spats in the McCain camp all the more damaging as Senator McCain looks to ride the race home with a consistent message focusing on Senator Obama’s relative lack of experience and a left-liberal economic agenda. But reports indicate Ms Palin may continue to make headlines in the final days of the campaign as she appears increasingly willing to disregard advisers’ orders and speak out on her own. Politico reported the Alaska Governor’s supporters were accusing McCain campaign strategists of already attempting to pin the blame on Ms Palin for the failure of the campaign. It later quoted advisers to Senator McCain reacting angrily to the report, branding Ms Palin a “diva”. The McCain sources said Ms Palin had repeatedly gone “off-message” recently, suggesting she appeared to be looking out for herself. Ms Palin has also been taking some heat over the $US150,000 ($220,000) spent on her wardrobe since late August, undermining her appeal as a down-to-earth working “hockey mum”.